Dropmix, shown behind doors at both Toy Fair and GDC last month, is a strange amalgam of physical and digital that’s used to create strange amalgams of music. Players place cards containing the bass, beat, loops or vocals of a song on the five slots of the Dropmix board. As soon as a card is placed, the corresponding sound begins playing on the Android or iOS device connected to the board. As multiple cards are placed, the mobile app seamlessly combines them into a single track. The cards utilize NFC (near-field communication) tech to be read by the board. Here’s a list of songs initially represented. 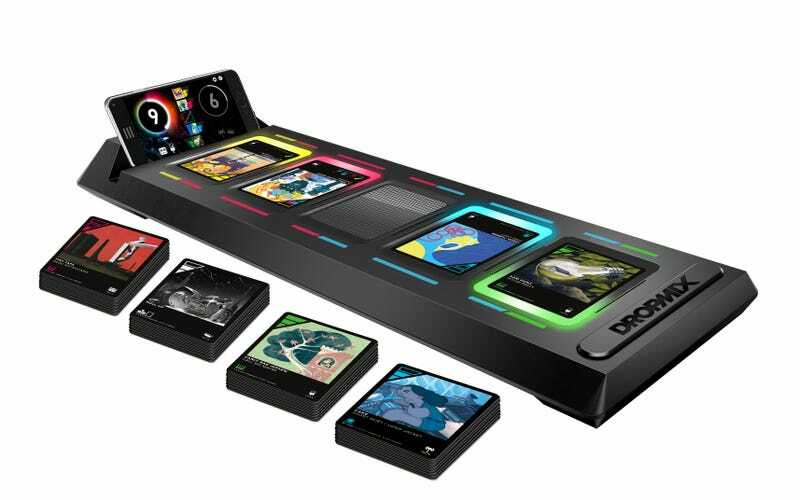 The Dropmix Muisc Gaming System includes 60 cards and the game board, and will be available in September for $99.99. Additional 16 and 5 card packs will be released for $14.99 and $4.99 respectively, with new cards released throughout 2017. There will be more than 300 cards available this year. While I’m unclear on how the actual game portion of Dropmix works, using cards to mix music together is a novel idea. We’ll have more info on how it actually works when Dropmix drops this September.